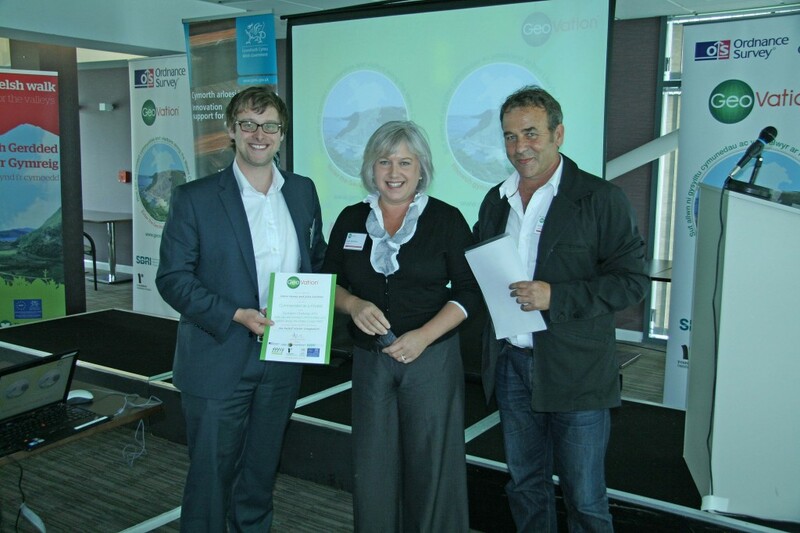 Well done to everyone who took part in the Wales Coast Path GeoVation Showcase in Cardiff yesterday. The GeoVation Challenge called for ideas to help connect communities and visitors along the newly opened Wales Coast Path. The finalists pitched their excellent ideas ‘Dragon’s Den’ style to the the judging panel and audience at Cardiff’s SWALEC Stadium. The judges then had the unenviable tasking of selecting the winners to receive a share of £125,000 in innovation funding to take their ideas forward. The audience voted for their favourite idea to win the Community Award of £1,000. Perfect Visitor Companion from Jamie Hanna and Julie McNiece of MyTourTalk. This multimedia video experience will guide visitors to the Wales Coast path through a smartphone app that would be 100% accessible as the geolocated data would be stored offline. This group was awarded £40,000. Food Finder from sisters Helen and Nicola Steer. This online app and offline map would highlight local, sustainable and delicious food (and beer), farms, wild food hotspots, food activities and places to eat along the path. Awarded £30,000, Food Finder also won the Community Award of £1,000 after a vote from the invited audience. Igam Ogam an idea from Cardigan team Steve Knight, Sean Vicary and Rowan O’Neill. This bi-lingual smartphone app will tell people’s local stories of the places and features along the path for visitors to the areas. Awarded £30,000. Living Paths – Roger Bamkin and Robin Owain of Monmouthpedia were the pair behind this idea which will allow communities along the path to create a Wikipedia page and post stories about their communities allowing diverse local information to become accessible. Awarded: £17,500. Our partners in the GeoVation Wales Coast Path Challenge are Technology Strategy Board’s SBRI programme, Visit Wales (Welsh Government), Ramblers Cymru and supported by the Inventorium programme.